Three days, three wins and a National Championship, that's exactly what IMG Academy out of Bradenton Florida did. First task was against Sunrise Christian out of Kansas handled them pretty easily 65-50. Game two was against was more intense battling against another Florida team not just any team but Montverde who's arguably been the best team in Florida and the country for a long time winning 4 of the last 6 National Championships. The game was lopsided late IMG was down 63-47 going into the fourth quarter, threw on a press that rattled Montverde, and it cost Montverde the game in the closing seconds, with a bad shot and defensive rebound and outlet to Jeremiah Robinson-Earl for a thunderous highlight body to body dunk on Harlond Beverly for a a thrilling 74-73 victory.. (Junior) Jaden Springer was special finished with 26pts. Championship Day IMG vs #1 La Lumiere, IMG was ready to go from jump, no lack of energy or rust from the grueling battle with Montverde. IMG jumped out 15-8 first quarter, led 31-26 at the half. 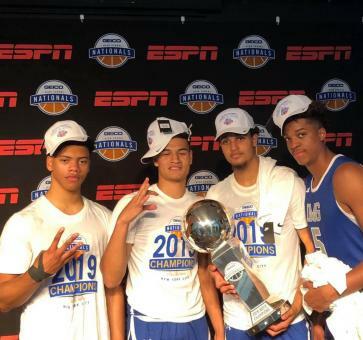 Second half came out and continued to take care of business, La Lumiere tried to cut it close, but IMG turned it up and went on a dunk fest off turnovers and went on to win there first National Championship. Huge congratulations to the whole squad!! !